Commuters have been given some good news ahead of Christmas, with an announcement that longer trains will come into service before the end of the year. South West Trains has confirmed the impending arrival of 10-carriage trains on the mainline that passes through Putney, Wandsworth Town, Clapham Junction and Queenstown Road stations, with more to follow early in 2014. Passengers in Putney are now in a position to benefit from longer trains after Network Rail recently completed platform extension work to enable 10-carriage trains to serve the station. In addition, Southern Railway has already introduced its first 10-car train on services out of Victoria, with more to follow on services through Balham and Wandsworth Common by Christmas. Southern will also increase the length of trains to Shepherd's Bush and Watford in May 2014 from four - five to eight coaches. 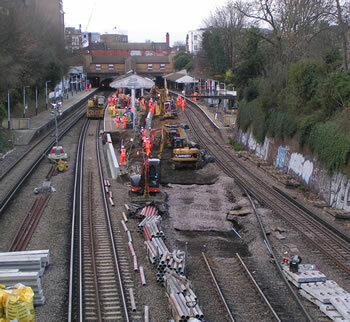 Network Rail is currently carrying out work to provide step-free access to Putney Station as part of an £8.5m improvement project. The work, which is expected to be completed by summer, 2014, will see a greatly enlarged concourse and three lifts installed in the station. This follows work at Earlsfield Station, which now has an attractive new entrance, new ticket office, a passenger toilet and two new lifts to the platforms as part of a £5.5m revamp funded by the Government's Access for All scheme, Network Rail, South West Trains and Wandsworth Council. In addition, the council has been carrying out work to upgrade pedestrian facilities by widening pavements outside the station entrance, removing unnecessary street furniture and providing more bicycle parking facilities.